Among the technical developments that have come to dominate our lives, television is surely one of the top ten. In the United States, more than 98% of households own at least one television set and 61% receive cable television. The average household watches television for seven hours per day, which helps to explain why news, sports, and educational entities, as well as advertisers, value the device for communication. The device we call the television is really a television receiver that is the end point of a broadcast system that starts with a television camera or transmitter and requires a complicated network of broadcast transmitters using ground-based towers, cables, and satellites to deliver the original picture to our living rooms. The U.S. television picture, whether black and white or color, consists of 525 horizontal lines that are projected onto screens with a four to three ratio of width to height. By electronic methods, 30 images per second, each broken into these horizontal lines, are scanned onto the screen. The development of the television occurred over a number of years, in many countries, and using a wide application of sciences, including electricity, mechanical engineering, electromagnetism, sound technology, and electrochemistry. No single person invented the television; instead, it is a compilation of inventions perfected by fierce competition. Chemicals that are conductors of electricity were among the first discoveries leading to the TV. Baron Ȯns Berzelius of Sweden isolated selenium in 1817, and Louis May of Great Britain discovered, in 1873, that the element is a strong electrical conductor. Sir William Crookes invented the cathode ray tube in 1878, but these discoveries took many years to merge into the common ground of television. Paul Nipkow of Germany made the first crude television in 1884. His mechanical system used a scanning disk with small holes to pick up image fragments and imprint them on a light-sensitive selenium tube. A receiver reassembled the picture. In 1888, W. Hallwachs applied photoelectric cells in cameras; cathode rays were demonstrated as devices for reassembling the image at the receiver by Boris Rosing of Russia and A. A. Campbell-Swinton of Great Britain, both working independently in 1907. Countless radio pioneers including Thomas Edison invented methods of broadcasting television signals. John Logie Baird of Scotland and Charles F. Jenkins of the United States constructed the first true television sets in the 1920s by combining Nipkow's mechanical scanning disk with vacuum-tube amplifiers and photoelectric cells. The 1920s were the critical decade in television development because a number of major corporations including General Electric (GE), the Radio Corporation of America (RCA), Westinghouse, and American Telephone & Telegraph (AT&T) began serious television research. By 1935, mechanical systems for transmitting black-and-white images were replaced completely by electronic methods that could generate hundreds of horizontal bands at 30 frames per second. Vladimir K. Zworykin, a Russian immigrant who first worked for Westinghouse then RCA, patented an electronic camera tube based on the cathode tube. Philo T. Farnsworth and Allen B. Dumont, both Americans, developed a pickup tube that became the home television receiver by 1939. The Columbia Broadcasting System (CBS) had entered the color TV fray and battled with RCA to perfect color television, initially with mechanical methods until an all-electronic color system could be developed. Rival broadcasts appeared throughout the 1940s although progress was slowed by both World War II and the Korean War. The first CBS color broadcast on June 25, 1951, featured Ed Sullivan and other stars of the network. Commercial color television broadcasts were underway in the United States by 1954. 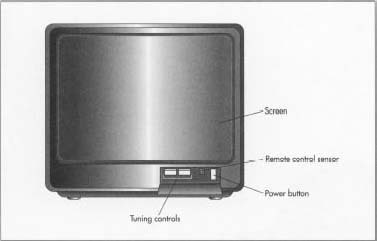 The television consists of four principle sets of parts, including the exterior or housing, the audio reception and speaker system, the picture tube, and a complicated mass of electronics including cable and antennae input and output devices, a built-in antenna in most sets, a remote control receiver, computer chips, and access buttons. The remote control or "clicker" may be considered a fifth set of parts. The housing of the set is made of injection-molded plastic, although wood cabinets are still available for some models. Metals and plastics also comprise the audio system. The picture tube requires precision-made glass, fluorescent chemical coatings, and electronic attachments around and at the rear of the tube. The tube is supported inside the housing by brackets and braces molded into the housing. The antennae and most of the input-output connections are made of metal, and some are coated with special metals or plastic to improve the quality of the connection or insulate the device. The chips, of course, are made of metal, solder, and silicon. 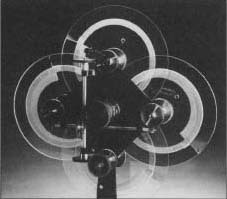 Prismatic scanning disc mount made by C. Francis Jenkins in 1923. To the surprise of most people, television transmission began almost 25 years before the end of World War II. John Logie Baird, in England, and C. Francis Jenkins, in the United States, both made public demonstrations of television in 1925. Unlike post-war electronic televisions, these early systems used mechanical scanning methods. Jenkins made significant contributions to optical transmission research during the 1920s. During 1922-23, he constructed mechanical prismatic disc scanners to transmit images. These scanners focused and refracted light through prisms ground into the edges of overlapping glass discs. As the discs rotated, a point of light scanned horizontally and vertically across a light-sensitive surface. This generated electrical signals necessary for transmission. In 1922 Jenkins sent facsimiles of photographs by telephone, and the following year transmitted images of President Harding and others by radio with an improved scanner. Unlike television, however, these first tests only sent still pictures. Jenkins publicly broadcast moving images with his equipment in 1925. His first 10-minute broadcast showed in silhouette the motions of a small operating windmill. By 1931, he had experimental television stations operating in New York and Washington D.C. He sold receiver kits to those wishing to view his telecasts and encouraged amateur participation. With other companies, Jenkins contributed to a small, short-lived mechanical television "boom." By 1933, however, the poor image quality of mechanical scanning convinced larger manufacturers to pursue the possibilities of electronic technologies, and the mechanical television era ended. Diagram of a television receiver. optics, and electronics engineers all participate in conceptualizing a new television design and the technical and sales features that will set it apart. A new design of television may have one or many new applications of technology as features. It may only be a different size of an existing model, or it may include an array of new features such as an improved sound system, a remote control that also controls other entertainment devices, and an improved screen or picture, such as the flat black screens that have entered the marketplace recently. Conceptual plans for the new set are produced by the engineering team. The concept may change and be redrawn many times before the design is preliminarily approved for manufacture. The engineering specialists then select and design the components of the set, and a prototype is made to prove out the design. The prototype is essential, not only for confirming the design, appearance, and function of the set, but also for production engineers to determine the production processes, machining, tools, robots, and modifications to existing factory production lines that also have to be designed or modified to suit the proposed new design. When the prototype passes rigid reviews and is approved for manufacture by management, detailed plans and specifications for design and production of the model are produced. Raw materials and components manufactured by others can then be ordered, the production line can be constructed and tested, and the first sets can begin their ride down the assembly line. 1 Almost all television housings are made of plastic by the process of injection molding, in which precision molds are made and liquid plastic is injected under high pressure to fill the molds. The pieces are released from the molds, trimmed, and cleaned. They are then assembled to complete the housing. The molds are designed so that brackets and supports for the various components are part of the housing. chemicals is allowed to settle on the inside of the face plate, and this coating is then overlaid with a thin film of aluminum that lets electrons pass through. The aluminum serves as a mirror to prevent light from bouncing back into the tube. Glass for picture tubes is supplied by a limited number of manufacturers in Japan and Germany. Quantities of the quality of glass needed for picture tubes are limited, and the emergence of large-screen sets has created a shortage in this portion of the industry. The large screens are also very heavy, so flat-panel displays using plasma-addressed liquid crystal (PALC) displays were developed in the 1980s. This gas plasma technology uses electrodes to excite layers of neon or magnesium oxide, so they release ultraviolet radiation that activates the phosphor on the back of the television screen. Because the gas is trapped in a thin layer, the screen can also be thin and lightweight. Projection TVs use digital micro mirror devices (DMDs) to project their pictures. A shadow mask with 200,000 holes lies immediately behind the phosphor screen; the holes are precisely machined to align the colors emitted by three electron beams. Today's best picture tubes have shadow masks that are manufactured from a nickel-iron alloy called Invar; lesser quality sets have masks of iron. The alloy allows the tube to operate at a higher temperature without distorting the picture, and higher temperatures allow brighter pictures. Rare-earth elements have also been added to the phosphor coating inside the tube to improve brightness. The electrons are fired by three tubular, metal electron guns that are carefully seated in the neck, or narrow end, of the tube. 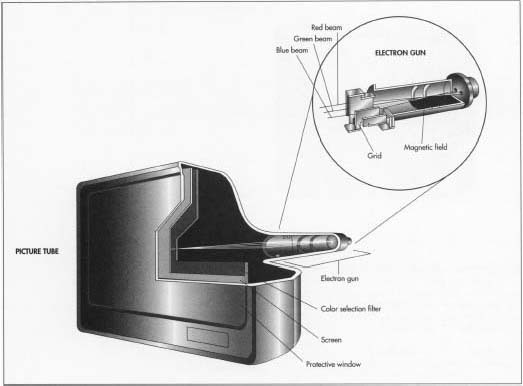 After the electron guns are placed inside the tube, the picture tube is evacuated to a near vacuum so air does not interfere with the movement of the electrons. The small opening at the rear of the tube is sealed with a fitted electrical plug that will be positioned near the back of the set. A deflection yoke, consisting of several electromagnetic coils, is fitted around the outside of the neck of the picture tube. The coils cause pulses of high voltage to direct the scanning electron beams in the proper direction and speed. 3 The housing also contains fittings for speakers, wiring, and other parts of the audio system. The speakers are usually made by a specialized manufacturer to the specifications of the television manufacturer, so they are assembled in the set as components or a subassembly. Electronic sound controls and integrated circuitry are assembled in panels in the set as it travels along the assembly line. The electrons are fired by three tubular, metal electron guns seated in the neck, or narrow end, of the picture tube. After the electron guns are placed inside the tube, the picture tube is evacuated to a near vacuum so air does not interfere with the movement of the electrons. A color selection filter with 200,000 holes lies immediately behind the television screen; the holes are precisely machined to align the colors emitted by three electron beams. 4 When the picture tube and the audio speakers and attachments are assembled in the set, other electronic elements are added to the rear of the set. The antennae, cable jacks, other input and output jacks, the electronics for receiving remote control signals, and other devices are prepared by specialty contractors or as subassemblies else-where on the assembly line. They are then mounted in the set, and the housing is closed. As with all precision devices, quality control for the manufacture of the television is a rigid process. Inspections, laboratory testing, and field testing are performed during the development of prototypes and throughout manufacture so the resulting television is not only technologically sound but safe for use in homes and businesses. There are no byproducts from the manufacture of the television, although many other devices are a part of the television "family" and are often produced by the same manufacturer. These include the remote control, computer monitors, video recorders (VCRs), laser disc players, and a host of devices that may require compatible design and components. Specialized televisions are produced for some industries, including television studios and mobile broadcast facilities, hospitals, and for surveillance applications for public safety and use in inaccessible or dangerous locations. Wastes may include metals, plastics, glass, and chemicals. Metals, plastics, and glass are isolated and recycled unless they have been specially treated or coated. Chemicals are carefully monitored and controlled; often, they can be purified and recycled, so disposal of hazardous wastes can be minimized. Hazardous waste plans are in effect in all stages of manufacture, both to minimize quantities of waste and to protect workers. The future of television is now. High Definition Television (HDTV) was developed by the Japanese Broadcast Corporation and first demonstrated in 1982. This system produces a movie-quality picture by using a 1,125-line picture on a "letter-box" format screen with a 16 to nine width to height ratio. High-quality, flat screens suitable for HDTV are being perfected using synthetic diamond film to emit electrons in the first application of synthetic diamonds in electronic components. Other developments in the receiver include gold-plated jacks, an internal polarity switch on large screens that compensates for the effect of Earth's magnetic field on image reception, accessories to eliminate ghosts on the screen, the Invar shadow mask to improve brightness, and audio amplifiers. Liquid crystal display (LCD) technology is also advancing rapidly as an alternative to the cumbersome television screen. Assorted computer chips add functions like channel labeling, time and data displays, swap and freeze motions, parental channel control, touch screens, and a range of channel-surfing options. Digital television of the future will allow the viewer to manipulate the angle of the camera, communicate with the sports commentator, and splice and edit movies on screen. Two-way TV will also be possible. Current screens may be used thanks to converter boxes that change the analog signal that presently energizes the phosphors on the back of your television screen to digital signals that are subject to less distortion—and are the language of computers. Computer technology will then allow a world of manipulation of the data as well as broadcast of six times as much data. The future of television manufacture may be anywhere but in the United States. Thirty percent of all televisions manufactured by Japanese companies are made in factories in Mexico. The factories themselves will soon be producing hybrids in which the television, computer monitor, and telephone are a single unit, although this development will take further improvements in compatibility between machines that speak analog versus digital language and the creation of PC-to-video bridges. Proof of the possibility of this integrated future exists now in Internet access that is now available through television cable converters and the living room TV screen. Barker, Dennis P. "High-tech tubes: today's technology delivers the best TV pictures ever." Popular Mechanics, April 1997, p. 60. "Bell Atlantic puts on its producer's hat." Business Week, April 18, 1994, p. 116E. Braithwaite, Lancelot. "Ghost busted: a first look at Magnavox's ghost canceler unearths new levels of image clarity." Video Magazine, November 1996, p. 56. Doherty, Brian. "Made in America?" Reason, August/September 1993, p. 50. Fisher, David E. and Marshall Jon Fisher. "The Color War." Invention & Technology, Winter 1997, pp. 8-18. Goldberg, Ron. "Adding TV to the PC." Popular Mechanics, April 1993, p. 138. Heald, Tom. "The next wave." Video Magazine, September 1996, p. 32. Levine, Martin. "Dark tubes stake a claim." Video Magazine, November 1993, p. 64. Lewyn, Mark. "Two-way TV isn't quite ready for Prime Time." Business Week, April 13, 1992, pp. 38-39. Miller, Michael J. "Yet Another Dinosaur?" PC Magazine, September 14, 1993, p. 81. "Mi TV es Su TV?" Business Week, November 1, 1993; p. 8. "Romancing the Stone." Video, December 1993, p. 12. "TV design receives gas assist." Design News, August 15, 1994, p. 28. "TV does digital: in a world of bits and bytes, you control the camera angles and everything you see on TV." Science World, February 7, 1997, p. 18. "Videotest: ProBono." Video, April 1996, p. 53. The block diagram for a televison receiver shows the antenna feeding into the audio channel. Of course, it should be connected to the tuner. "chemicals are allowed to settle on the inside of the face plate"
i am presently owning 8 years old AKAI Television, recently it has stoped working neither vedio or audio,please suggest what must have gone wrong..